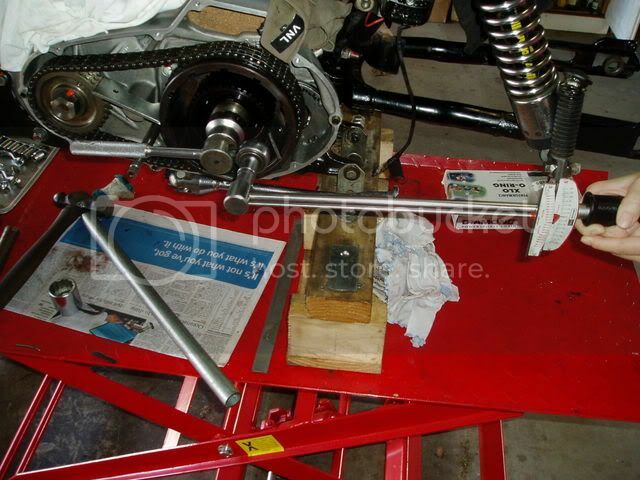 My favourite cylinder installing rig: a wooden spacer with slot to hold piston steady as I slide the cylinders on. 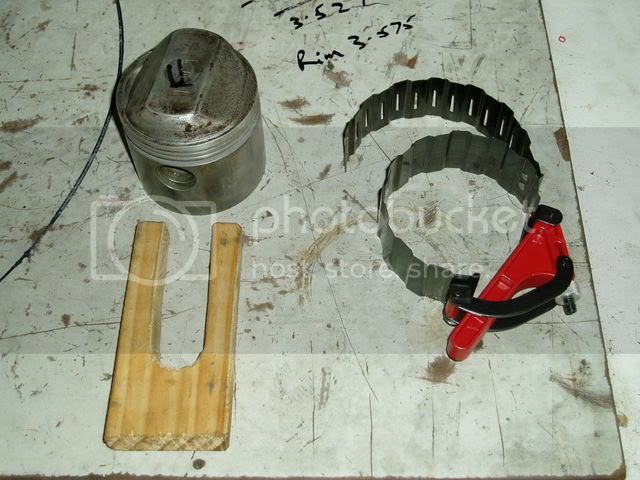 And a Volkswagen "krinkle cut" ring compressor that comes apart after the cylinder is on. 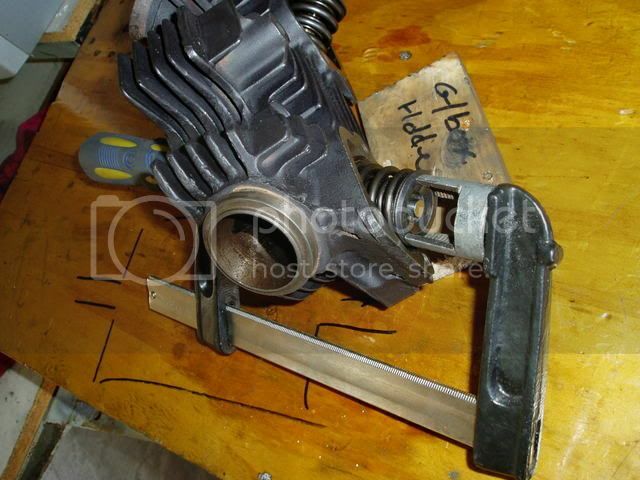 The crinkle cuts stop it jamming up in between the piston and cylinder. Easy peasy. 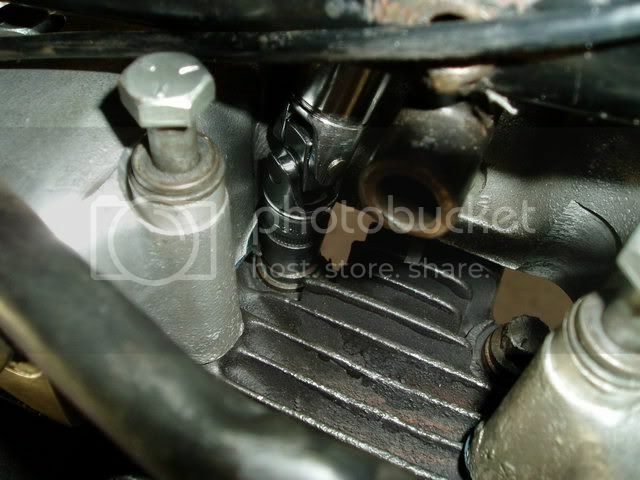 Also, use plenty of oil in the rings, piston and cylinder to help it all slide on. 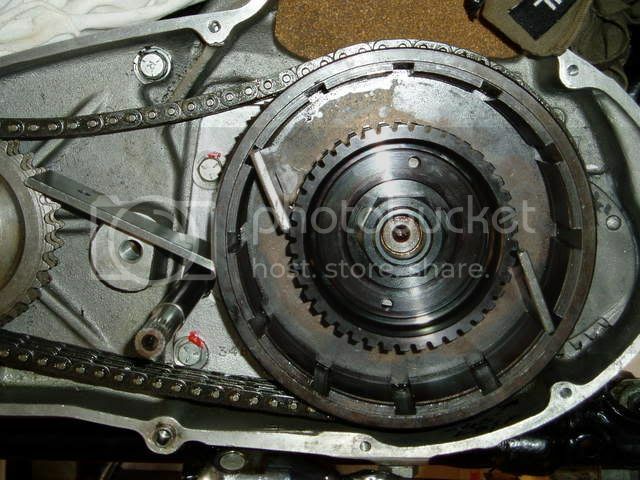 This is the sprag I used to jam the clutch and engine sprockets to tighten the engine mainshaft nut (120 foot pounds). 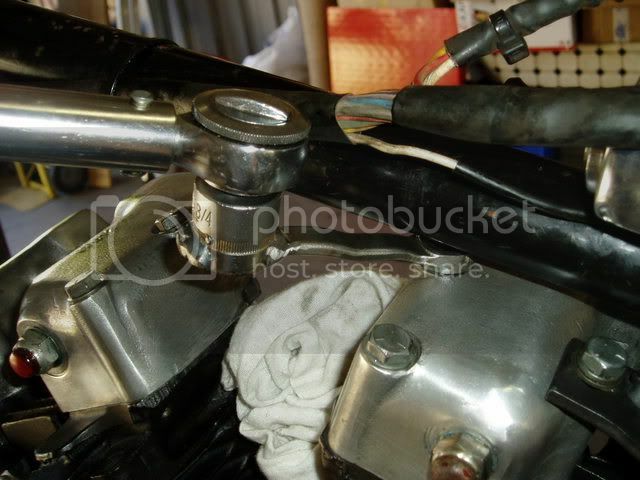 It has a divot cut out of it for the where the footpeg mount goes in a 77 model. It is right on 4" long, made from about 1/4" flat strap, wide enough to fit on all three rows of the teeth on the sprocket. 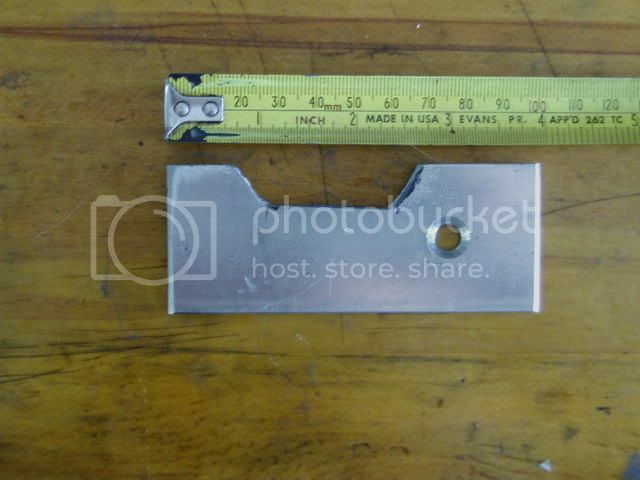 It is made from a piece of scrap metal so the countersunk hole is not necessary, just part of whatever it was before it became a special tool. 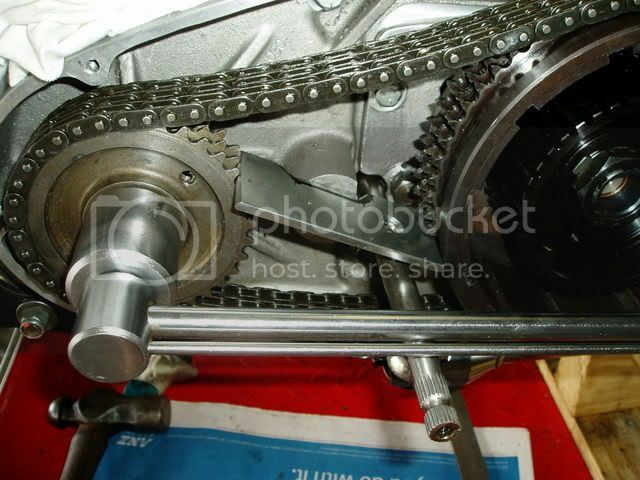 It fits between the two sprockets to stop them turning. The chain pulls tight on one side and counters the forces on the sprag bar, so it works real easy without stressing the shafts or cases. 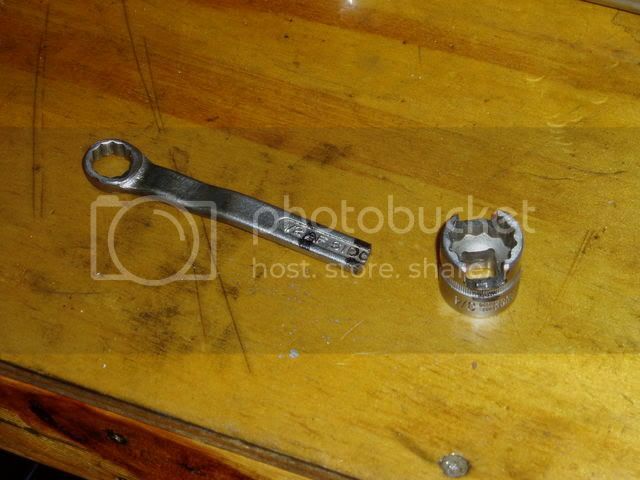 I use a long torque wrench to tighten the engine sproket nut. Using an impact gun can possibly shock your flywheels out of alignment so I prefer the old way. 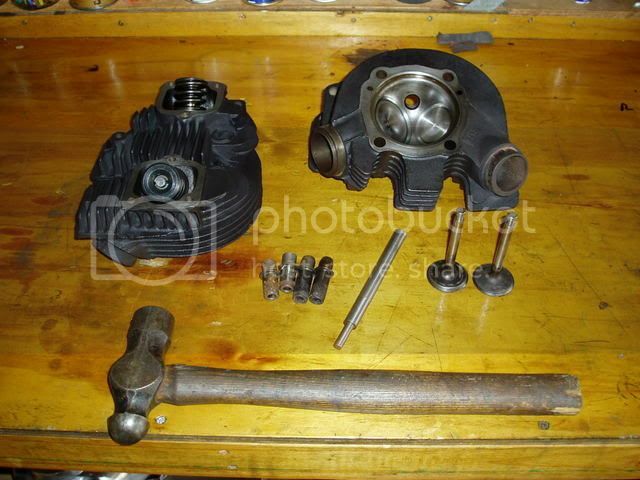 Two more little pieces to jam between the inner and outer clutch drums, with the main sprag still in place. You have to be careful to keep them all in position when tightening. 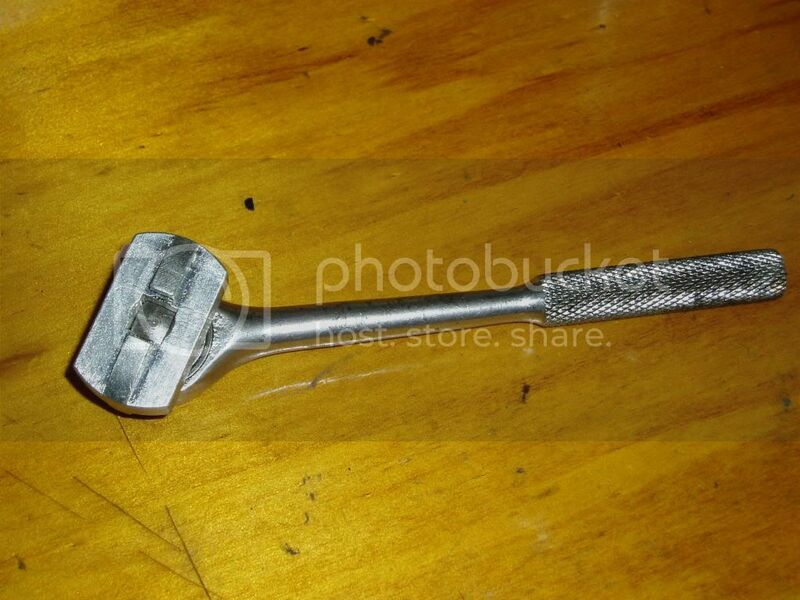 I bought one of these from JP Cycles that goes on a 3/8 socket set. Wish I had one 30 years ago, before I chewed up my filler plugs using all manner of screwdrivers and things on them. Valve guide drift, old guides and valves. (And legendary BFH, standard HD factory fix everything tool, 2LB) The drift is slightly smaller than the hole in the smaller exhaust guide and stepped up to slightly smaller than the part of the guide that fits in the head so it can knock the old guides out. Wooden jig to hold head while working on it, changing guides etc. The valve stems and springs sit in the slot when you turn head over. Piece of wood at the end means the intake stub bears against it when knocking in the new guide and does not get banged up against hard objects. My homemade valve spring compressor, a G clamp and a pipe fitting with a slot hacksawed into it. Pic: 1/2" drive torque wrench for 60 ft lbs, shown here on rear head, using universal joint and 3/8 drive socket to access head bolt. More about that little game later. This one I bought ages ago. 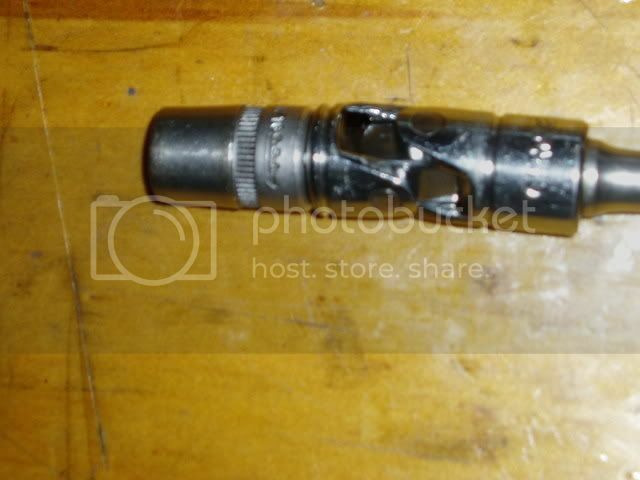 A 3/8 drive universal joint. It needs to be a good quality one so it is slim enough to fit the very tight space, and to take the 60ft lbs torque required on the head bolts. This is hooked to a very slim 3/8 drive 7/16AF socket, a 4-inch extension and a 3/8 to half-inch adaptor to hook it to my bigger torque wrench. Pic, if universal joint is too fat, it might need grinding down a little bit, but mine was ok.
Pic: Universal joint in action. 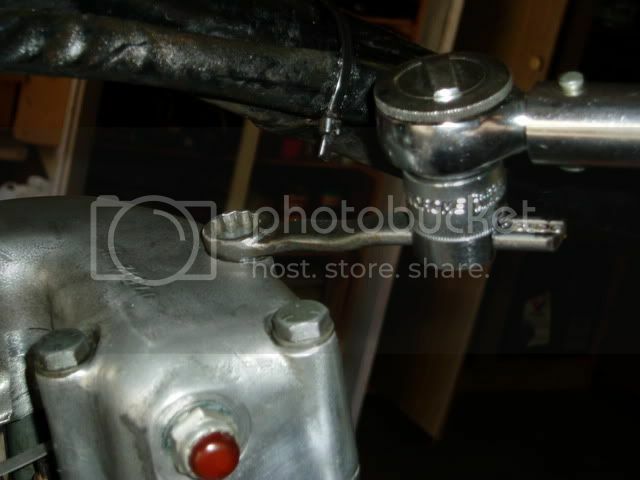 This is the toughest one to do, the front right stud on the rear cylinder. Pic: Small torque wrench for initial tighten to 20, then 40 ft lbs. 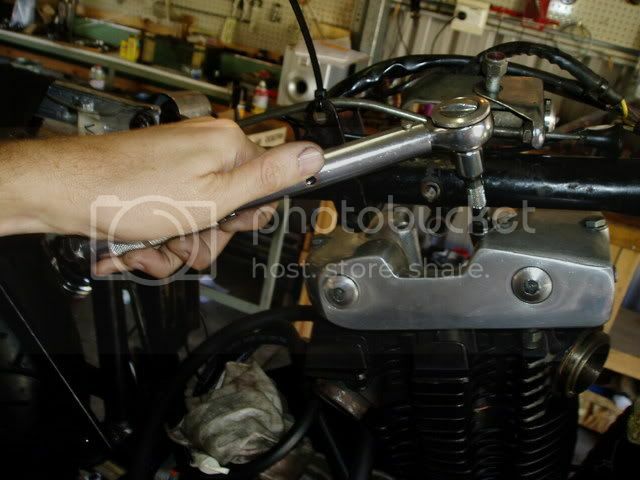 Dont hold your torque wrench like this if you are really using it. Hold by the proper handle bit, without thumb extended. It can affect the torque reading. Pic: Big torque wrench for final tighten to 60ft lbs. 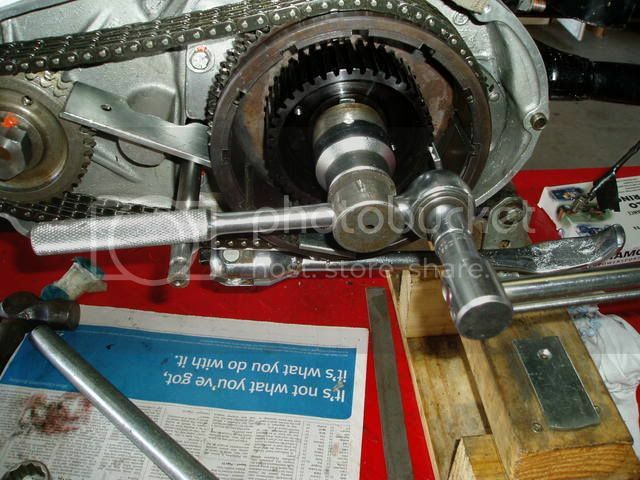 The purists will argue that the torque reading could be put off by the angle of the universal joint etc. I tried it on the easy to get to head bolts, tightening straight and tightening crooked, and then seeing how much torque was required to loosen the bolt, and I could see no noticeable difference on a wrench like this with a dial rather than click. I am happy they are as near as dammit. All this can take some jiggling. The universal joint works in some positions, but not others, so you have to take it off and turn it around a little. 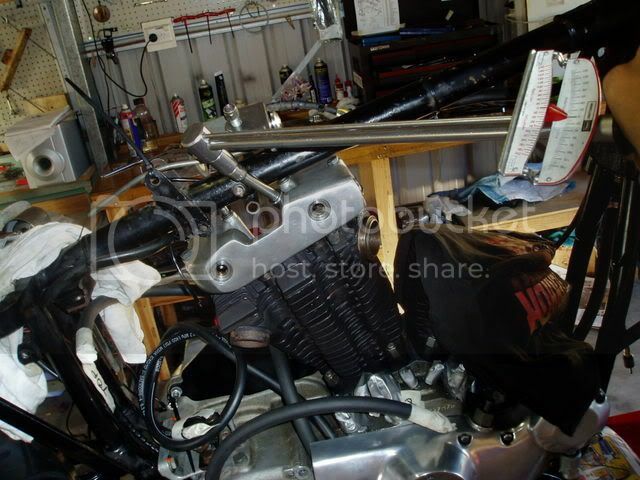 Also make sure the socket is all the way down on the bolt head before putting 60 ft lb on it. My best advice is to use top quality brand tools, they are slimmer and made of stronger steel and fit better. My favourites, but I cant always afford them are Stahlwille, German made. Thin, light, but strong. 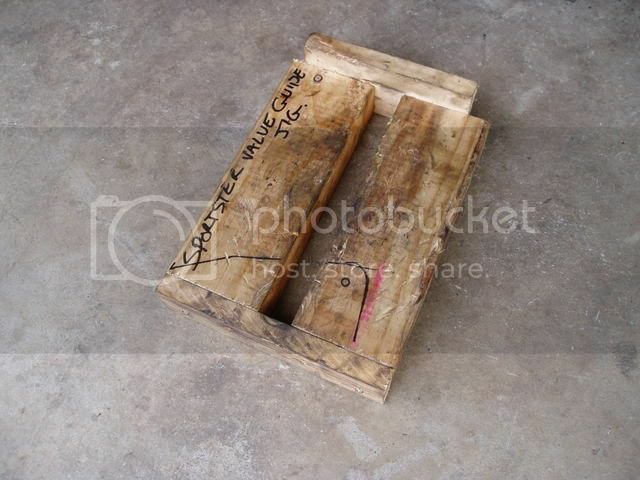 Torque rocker box bolts to 20 ft/lb. 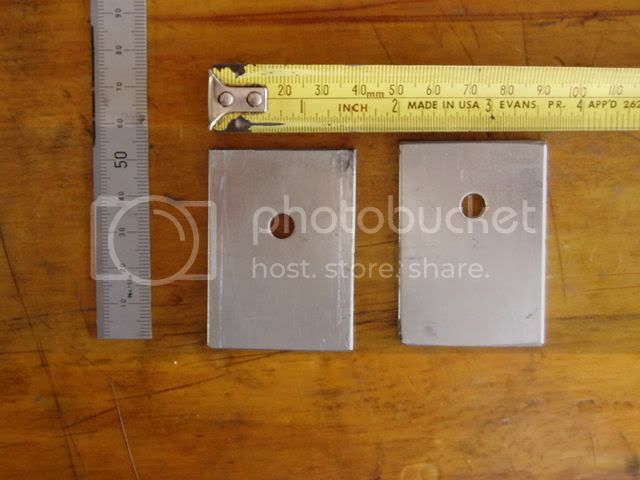 I made a special 3-inch extender to get in under the frame to the middle ones. 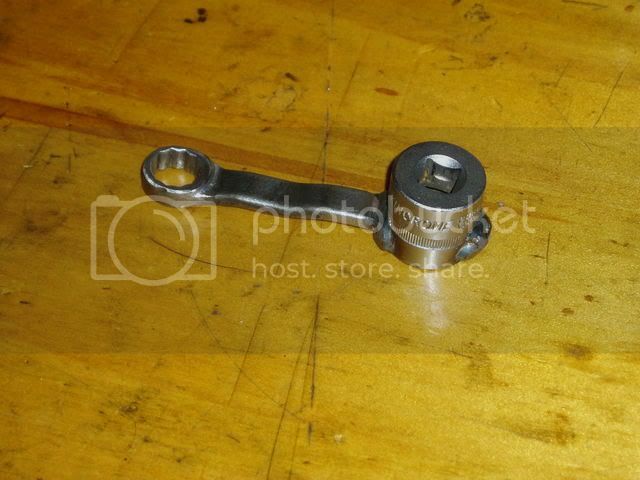 It is basically a ring spanner (box wrench to you, I think) cut off to 3 inches long and a 3/8 drive socket welded on for the torque wrench to fit into. 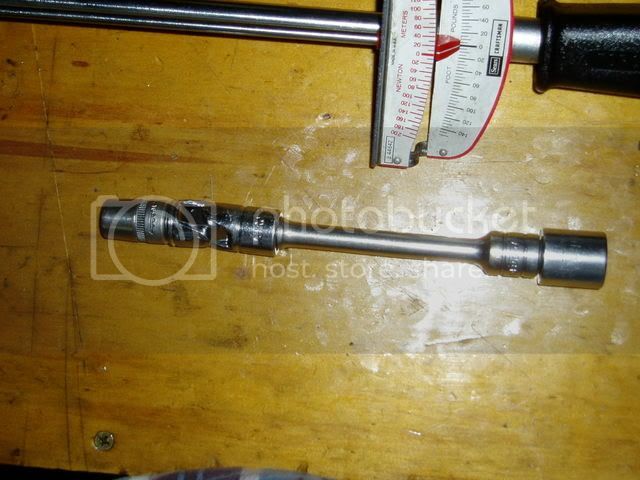 Torque with this rig to 185 inch pounds on my 10-inch wrench give 240 inch pounds (20 ft lbs) at the bolt. 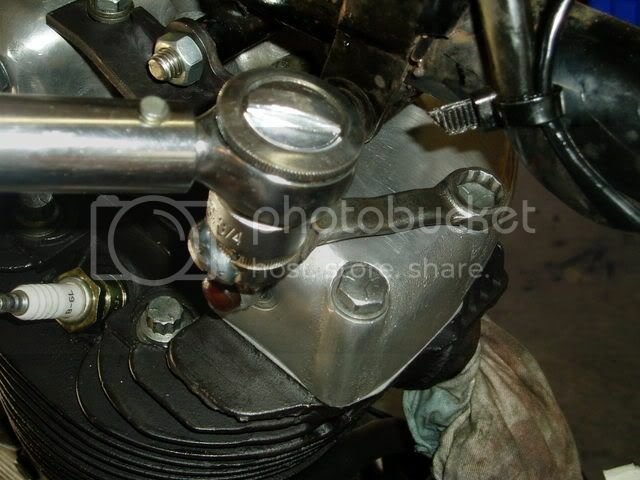 Pic: Using a 3-inch torque wrench extension to tighten rocker box bolt under the top frame rail. Pic: Wrench cut down, socket notched with my 4" angle grinder. Pic: Torque wrench extender welded and ready to use. Torque rocker box bolts to 20 ft lbs. 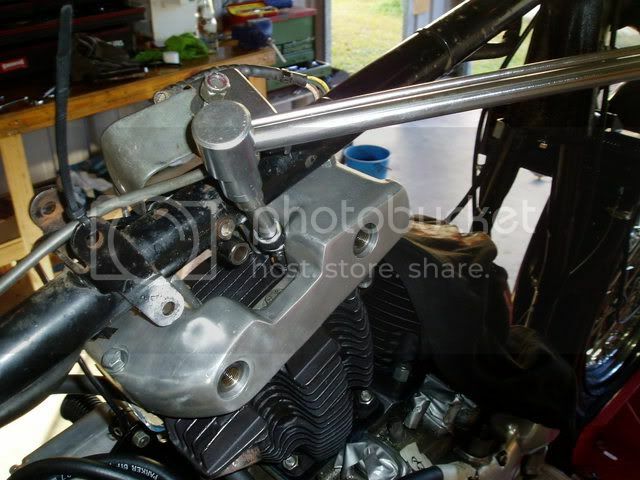 Use the abovementioned wrench cut down to 3 inches long and welded to a 3/8 drive socket to get in under the frame and torque those rocker bolts to show 185 inch pounds on my 10 inch torque wrench, to give 240 at the bolt. .
Pics: Torquing rear rocker box bolts with torque wrench extender. Keep the extender straight out in front of the wrench. 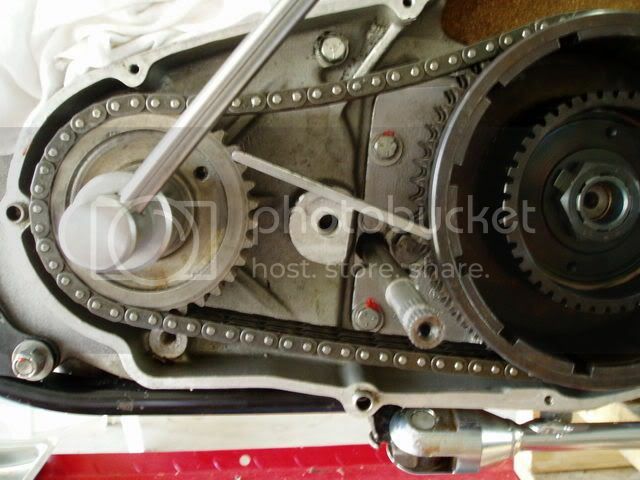 Don't let it move out of line more than a ratchet click or two, otherwise it can affect the torque reading. 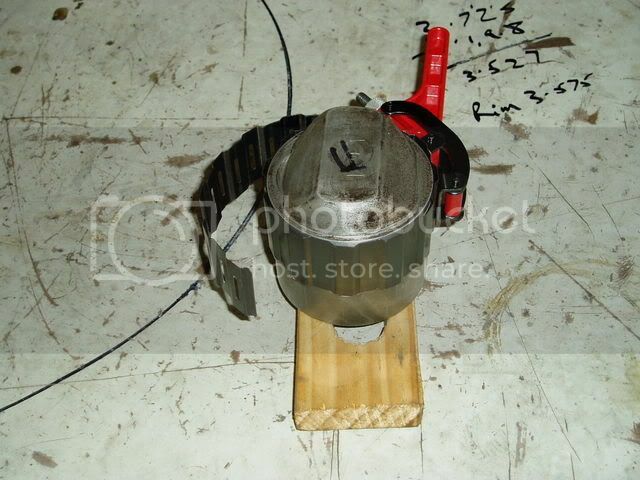 Ok guys that's all i can find in my pile of pics of special tools. So please go ahead and add your own posts on special Ironhead tools you have made or bought. I am sure there are many more elegants examples than my rough budget models out there. 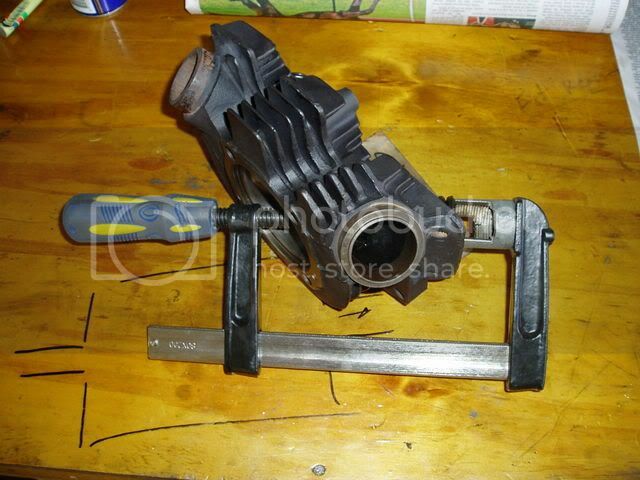 Eg, Shadowdog500's great little clutch actuator tool back in post #5.